What is a Fishing Cooler? Having a cooler than not only looks cool, but stays cool, is an important piece of gear for many different outdoor activities. When your fishing keeps you out on the water all day on a hot day or even for multi-day trips, having a quality cooler is important for storing food and maybe even bringing home pounds of fish for fillets. While any insulated cooler can technically be used for fishing, there are now products on the market catered specifically towards anglers and hunters. Generally speaking, most outdoor enthusiasts use coolers that fall into one of two categories. Traditional chests and insulated bags; both of which serve anglers well and are versatile enough for other types of activities. Insulated Chest are the traditional go-to cooler for any activity, particularly fishing. They come in a variety of sizes and can accommodate large amounts of stuff. They serve a dual purpose as a great sturdy sitting surface (a nice addition on some boats). However, most are big, bulky, and take up a lot of room in and out of use. I use ithem for both food/drink and storing fish. However, if you are storing uncleaned fish, it is often better to have a dedicated fish cooler so you don’t have to scrub out that fishy smell all the time. Better yet, consider a fish bag to compliment your food cooler. Insulated Fish Cooler Bags are a much more portable and packing-friendly option for casual anglers. It can do nearly as good of a job, if not better, at keeping its contents cold than a chest cooler. They are generally flat in profile and as such, are great at holding whole fish. The flat profile doesn’t quite allow them to free-stand and thus, using it as a food cooler isn’t as ideal. However, they can still be a dual purpose option and are very packable in use and are easy to store when not in use. Selecting a cooler for fishing can very much come down to a set of personal preferences. Taking into consideration many different variables such as size, features, rod holders, extra storage, wheels, etc, it is easy to get lost in the spectrum of choices. While most of the choices come from these sorts of “personal preferences”, there are a few things to take into consideration. Insulation is perhaps the biggest consideration and directly relates to ice/cold retention ability. If you need a cooler for multi-day excursions, consider getting something with over an inch of insulation. However, for quick day trips, you can get away with a lighter weight and more compact option with less than one-inch thick insulation. Drain Plug is another feature to consider. Decide whether you need one or not. Generally, smaller models don’t have a drain plug and larger ones do. Size and Portability are other big factors. What size you choose depends on your needs. If weekend camping excursions with the family are common, try looking at a 50 or 65-liter at a bare minimum. If day trips are more your style, you will likely benefit more from a size of 50-liters or less. Now we are going to switch gears and take a look at the models on our list. Let's start with the best insulated cooler bags, then dive into the the best fishing coolers of the year. Waterproof Fabric on the inner and outer layers makes sure it doesn’t soak up water on the boat deck and will make cleaning out the inside of the bag very easy. Shaped to Hold Fish Whole - This insulated bag cooler was designed with storing whole fish in mind to preserve them quickly. Being a flat bag design with hefty dimensions (40” x 16”), you could load this thing with even several large salmon. Not Designed as a Food/Drink Cooler - Due to the flat shape and its inability to free-stand, it doesn’t serve too well as a casual food/drink cooler. However, it still insulates well and will certainly keep its contents cool no matter what they are. 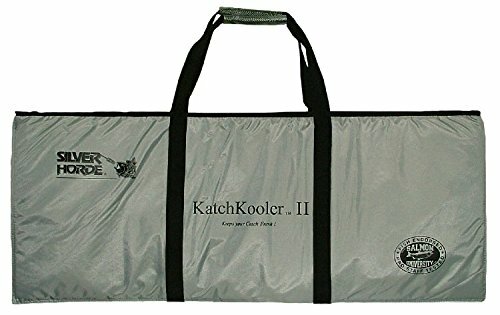 The KatchKooler II insulated bag by Silver Horde is designed specifically to hold fish and keep them cool. It is not so much designed as a food/drink cooler, though it can always be utilized for such. What makes it more intended for holding fish is the shape and profile of it. This insulated bag doesn’t quite have a flat bottom to allow it to stand up. This bag is more flat-shaped with dimensions of approximately 40” by 16”. The shape and size of this show its intent to use for storing and cooling fresh fish. With the size, you can load it up with ice and stack fish in it all day long. Simply bleed your large fish out before throwing them in the bag on ice. The outer and inner fabric layers are sealed and made of waterproof fabric to make cleanup/disinfecting a breeze. Additionally, it features two reinforced grab handles to make picking up that heavy load of fish even easier. If your main objective is to stack loads of whole fish into, this might be your best bet. At a convenient size, it is handy to have for a handful of trout all the way up to 50 plus pounds of salmon. This no-frills, insulated, and waterproof cooler bag is a safe bet. Heat Sealed Seams mean there is no thread or fabric to soak up liquids. The waterproof fabric and thread-free seams make keeping this bag clean a much easier task. Tons of Available Sizes makes finding the right bag for your needs a breeze. Whether you want a small bag that can even fit in your backpack or a giant six-foot long plus boat bag to throw whole fish into, Canyon Cooler has you covered. The largest sizes come with a drain plug. Made in the U.S.A. - There is a lot of hype in regards to American made products nowadays for a reason. They are made in the area where they are used the most, the Grand Canyon. As such, this company receives regular feedback on the harsh use of their products. With quality construction and a lifetime warranty on your cooler, Canyon is a hard brand to go against. Not Ideal for Food/Drink- Once again, due to the flat profile, they don’t make good casual coolers. Their shape and profile are much better served a dedicated fish bag. Though nothing is stopping you from storing some drinks on ice until the fish start biting. Canyon Brand coolers have made a reputable name for themselves in recent years. This company is a made in America company based out of Flagstaff, AZ; the hub of all Grand Canyon River activity. Canyon developed their brand for river trips through the Grand Canyon desert. As such, they became well-versed in properly insulated coolers that are highly functional and packable. 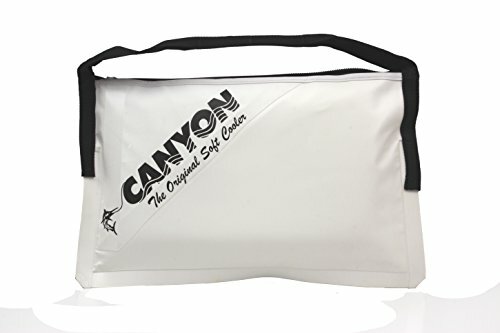 In addition to the hard-sided models that gave Canyon Cooler their reputation, they produce several other insulated cooler-type products. One of which is a fish cooler bag meant for anglers to easily store whole, dead fish in for quick preservation on ice. This fish bag is well-insulated with one-inch of foam and features a reflective white, heavy duty, fiber-laced outer fabric that remains waterproof, keeping your boat clean and your inner contents safe. Heat-sealed seams mean no stitching to soak up blood, grime, and odors. Additionally, it has two sewn-on 2” webbing handles to make transport and carrying simple. One of the best features is the wide range of availability in size. This bag comes in nearly a dozen different sizes that hold anything from small trout and bait to large swordfish up to eight feet in length. Canyon Cooler designed a bag specifically with storing whole fish of all types in mind. Canyon Cooler, an American-based company, has developed a reputation for building insulated coolers built to take a beating and keep stuff cool in some of the harshest environments out there. 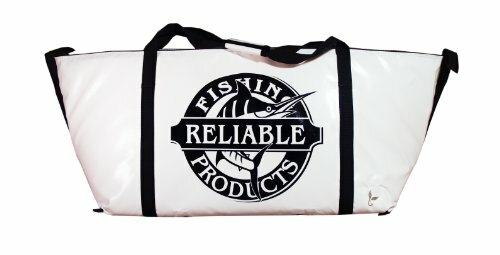 If you are looking for a fish cooler bag, particularly a very specific size, this comes highly recommended and is a safe bet with a lifetime warranty. High Capacity and Wide Mouth mean you will be able to stack this bag high full of fish all day long. Freestanding Design makes it more convenient on board a boat and can be better used as a food/drink cooler. Not a Budget Option, for the insulation this bag provides, it is not necessarily a budget option. This plus-sized fish bag is great to have on your boat and is able to fit pounds and pounds of whole fish in it. The heavy-duty, marine-grade vinyl is waterproof, mildew-resistant, UV-resistant, and easily washable. The insulation comes from flexible closed cell ½” foam, protected by durable vinyl inside and out. Unlike other dedicated fish bags which are flatter in design, this cooler bag features a gusseted bottom, allowing it to free-stand. This, in my opinion, also makes it a good candidate for a food/drink cooler. The overall size is approximately three feet by one foot at the base. The top opening is larger to making loading and unloading your catch easier. For a high capacity fish bag that conveniently free-stands in the bottom of your boat, here is your answer. With a flat bottom, wide mouth, and durable design; it is a great addition to your boat if you plan on taking fish home. As promised, below are our favorite picks for the top must haves of the year. Molded Plastic on both the inside and outside to protect the insulation inside and make for a clean surface. The smooth and reflective plastic aids in keeping the contents cool and makes for ultra quick cleanup. No nooks and crannies for liquids to build up and form odor. Integrated Rod Holders make it even more suitable for fishing. The rod holders can be used for simple transport or you can even slide rods in and wait for the fish to bite. As it makes a good seat, this is a great option to have for days spent on the bank of a lake or river. Smaller Sizes - This is designed to be a more portable day-use option. Although it is available in a few sizes, there is nothing over 35 quarts, so forget trying to store pounds and pounds of whole salmon or salmon fillets in this one. It does make a great all-purpose day trip cooler, however. There are times you need to keep things cold or dry, and sometimes you need both. Engel has produced their coolers to be airtight, insulated, and lightweight, making them essential pieces of gear for all sorts of outdoor adventures. The airtight seal is sure to keep the hot air from getting to the contents while keeping the inside icy cold. The tight seal keeps them totally waterproof up to a depth of three feet. The primary use is keeping food cold and fresh, while tight seal also makes it a perfect place for cameras, temperamental electrical equipment, medines, or safety equipment. The expanded polystyrene insulation is encapsulated in seamless, reflective, and non-absorbent molded plastic, not only giving it an attractive design but maintaining total functionality and ease of cleaning. Being a product designed for use around boats and water, it is built with marine-grade hardware to keep it durable and corrosion-resistant. 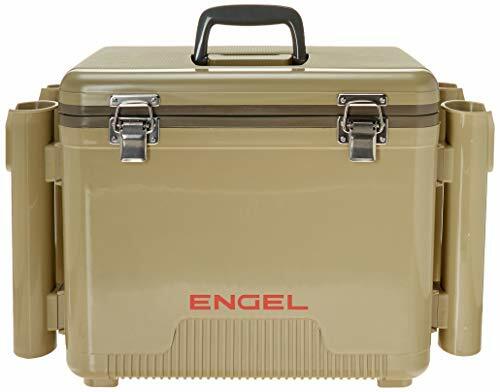 This portable and attractive cooler by Engel makes a great addition to the gear stash of any outdoor enthusiast. For the angler, this is great for a day out on the boat or fishing on the bank. It makes a great food/drink cooler foremost and can store smaller fish or fish fillets as well. It makes a great seat, is totally airtight to keep stuff safe, and features four fishing rod holders to top it all off. Did I mention it is available in some fun colors? Affordable - Best of all, for a high functioning cooler that will keep its contents cold, it comes in at a very affordable price. Forget dropping several hundred on an over-hyped hard chest model. Save the money for something else and get one you won't be too worried about beating up and getting dirty. The Large Size makes this a great addition to a big boat trip or for a weekend adventure. With enough room to store food, drinks, and even fish or meat, it is a great all-around option to have nearby. Whether you stack it full of whole catfish or have meals prepped out for a week of camping, this will do the job without breaking the budget. Its sturdy build also makes it a great seat for on the boat or when at the camp. One Size Only- It’s large size will be a drawback for someone looking for a convenient day sized cooler. The job is to support you for multiple days or have room for lots of fish in it. A simple, no fuss, no fancy, working-class cooler. Despite the Coleman Coastal Extreme series looking like any other you can pick up at Walmart, it features higher building standards, making it more suitable for rugged outdoor use. It doesn’t look too fancy though. This is what helps keep it at a nice budget price. It’s a simple molded plastic cooler like most people are used to and it gets the job done. 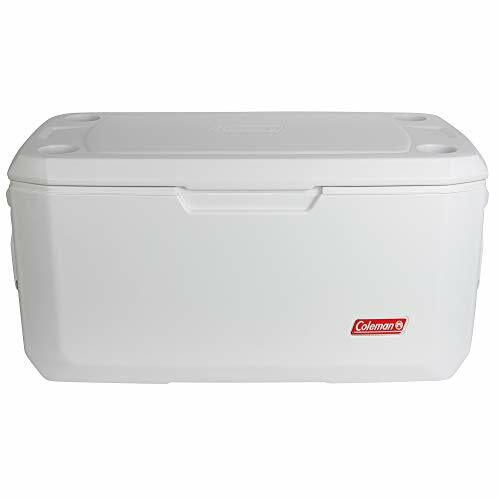 This large 120-quart capacity cooler is an excellent for multi-day camping or a big boat. With it being this size, you will have plenty of room for food and drinks to coexist with whole or filleted out fish in there as well. Coleman claims this is able to retain ice for up to six days at 90 degrees Fahrenheit. Being a Marine-rated cooler, it features corrosion-resistant and heavy-duty hardware to stand up to years of abuse. Being so large, you will appreciate the integrated drain plug. This serves an excellent role as a large chest cooler for weekend or boat getaway that is still affordable. You don’t have to spend big money on a big name brand cooler. Conversely, buying a cheap option at your local store is not a good long-term investment. This Coleman cooler fills the middle ground with a well-built yet affordable chest cooler. Legendary Ice Retention is what gives YETI its reputable status. With features such as extra-thick insulation, overlapping/interlocking lid system, and cold lock gasket, you can expect your contents to stay cool for days on end. Rotomolded Construction is what gives the YETI Tundra is legendary durability, ease of cleaning, and iconic design. The white reflective plastic helps to deter the sun's heat and makes cleaning a breeze. If white is not your ideal color, thankfully YETI makes a handful of other fun colors. Heavy and Bulky is one of the downsides of these heavy-duty molded coolers. While thick insulation and heavy-duty plastic are great for ice retention, it makes it extra bulky and extra heavy. 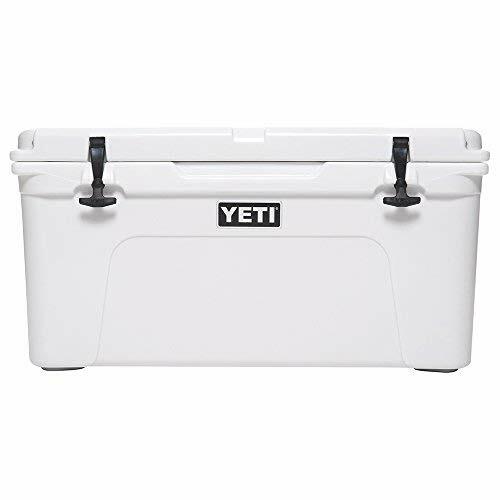 From the name that started the recent cooler fad, YETI is now a product synonymous with insulated coolers of all types. However, one of the designs that started it all, the classic Tundra 65, is one that can now be found in the backs of vehicles nationwide. The attractive Rotomolded construction is not only what gives it the iconic attractive look, but it is a serious coat of armor that is virtually indestructible. The Tundra line also hosts the T-Rex Lid Latches made of heavy-duty, yet flexible rubber to ensure a quick and tight seal of your lid and don’t have to worry about breaking it. It is tough to name all the great features of the Yeti Tundra line but here are a few. An Interlocking lid system keeps it airtight and cool. Tie down slots allow you to secure it to a boat, truck, or raft while still being able to open and close it. It also has lip grip handles along with rope handles which allow for different carrying configurations. These are just a few of the features that make the YETI Tundra a great choice. Whether you are loading food for a week-long excursion, stacking up walleye in your boat, or cooling food and drinks for a weekend BBQ, the YETI Tundra 65 is sure to impress. There is a reason it is one of the most popular coolers out there right now. For normal cooler use, a quick rinse before and after is good general maintenance. Most are designed with slick and resistant plastic on the inside to aid in cleaning. If you are using your cooler for whole dead fish or it had something spoil inside of it, a little deeper cleaning might be in order. Any sort of disinfectant and/or degreaser is a simple way of cleaning it. Give it a good scrub down and final rinse and you should be good to go. Baking soda also helps to absorb any unwanted odor. Now it is time for you to make the decision on whether you need a fish bag or a chest cooler to add to your gear arsenal. While fish bags are an excellent tool to have for storing fish, they don’t serve many other purposes. A hard chest cooler can be the best of both worlds but is generally bulky and heavy. The one you end up with will hinge on your own preferences and needs. Armed with a little knowledge, the decision should be easy.